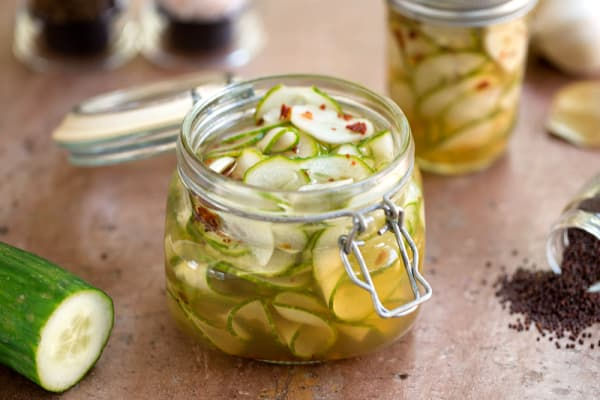 Get tangy cucumber strings cured in under an hour with this quick-pickle recipe. Long curlicues make these perfect for serving over hot dogs. They won’t have the same shelf life as traditionally preserved pickles, but you’ll plow through each batch so quickly, it won’t matter! Spiralized English cucumbers are submerged in a brine of rice vinegar, lemon, garlic, maple syrup, mustard seed, red pepper flakes and salt. Even after only 30 minutes the cucumbers will begin to pickle! They can be stored in the refrigerator for up to one week. Add ½ cup fresh chopped dill to the pickling liquid for that classic deli pickle flavor. Alternately, you can double the maple syrup for a bread-and-butter pickle sensation. Per Serving: 27 calories; 0g fat; 4.8g carbohydrates; 0g protein; 0mg cholesterol; 358mg sodium. I LOVE making pickles and I LOVE my spiralizer, so this was an obvious pick! so tasty. I doubled the maple syrup as the mealthy tip suggests and these were just so delicious and really just like a bread and butter pickle. This is the best! I added fresh dill, as recommended, and they turned out amazing. Much better than store bought. They taste so fresh! 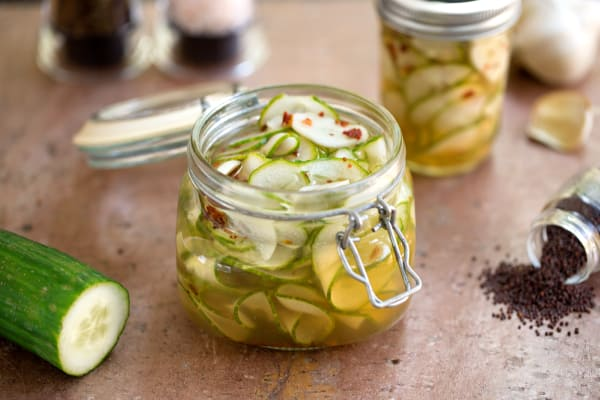 Perfect for your pickle cravings!